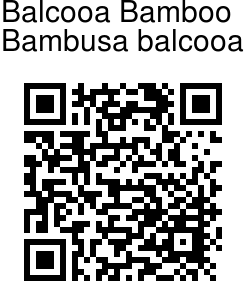 Balcooa Bamboo is a common homestead bamboo in North East India and West Bengal. Also occurs in Bihar, Jharkhand and Uttaranchal. The culm (stem) is up to 30 m tall, dark green and thick-walled. the diameter of the cavity about one-third of that of the culm; nodes thickened with a whitish ring above, hairy below; internodes 20-40 cm long; branches from the lower nodes leafless and hard, mostly spreading, sometimes thorn-like; young shoots blackish-green, green with yellow, brown or orange tinged culm-sheath, clothed sparsely with dark brown hairs. Leaves are 15-30 cm long, 2.5-5 cm broad, oblong-lanceolate, glabrous above, pale and puberulous beneath, margins rough, apex pointed, somewhat heart-shaped or rounded at base with a short stalk. Inflorescence is a large panicle, bearing spikate branching with bracteate heads, 0.6-1.2 cm long, 4-6 mm broad with 0-2 empty glumes. The clump/plant dies after flowering without setting any seed. 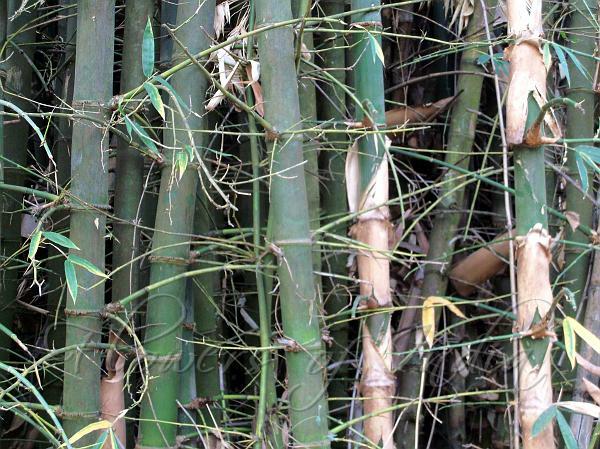 The most common use of this sturdy and strong bamboo is in house construction. It is a good bamboo for scaffolding and ladders.